ALL NEW & MODERN! Beach Front Luxury on Millionaire's Row! Two pools, one heated, the other with a cascading waterfall, poolside gym, playground, Tiki bar serving casual meals and drinks, gourmet restaurant offering room service, dinner, and a breakfast buffet. 24 hour Concierge service, coin operated laundry machines on every floor, 24 hour security, valet parking and optional high speed internet, salon/spa, beachfront! This big beautiful two bedroom two bathroom apartment is fully gut renovated and ALL NEW! FEAUTURES INCLUDE a BEAUTIFUL GRANITE kitchen with stainless steel sink, eating counter and everything you need to prepare a gourmet meal! The large furnished terrace features beautiful water views of both the ocean and the intracoastal waterway. Designer furnishings, marble floors, TVs in every room. Super Comfortable with every amenity! Linens and towels provided. Beach chairs and umbrellas available near pool . Right ON the Beach and just moments from South Beach, Art Deco district and Bal Harbor shopping! 30 minute drive from Seaquarium, monkey jungle, Parrot jungle and more! 15 minutes from Miami Int'l airport, 35 minutes from Ft. Lauderdale Int'l airport. Coin operated laundry machines on every floor of building. High speed internet connection/WIFI in apartment.Valet parking included with rental. 5 minutes by car from South Beach Night Life. Near the heart of Art Deco district and not far from Miami Seaquarium, Monkey Jungle, Parrot Jungle. 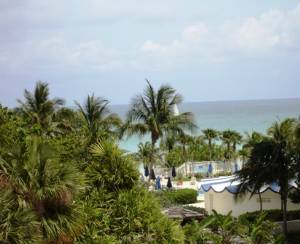 Elegant Bal Harbor ten minutes away by car. Convention center 6 minutes away by car. 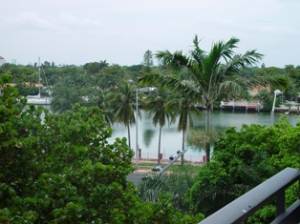 beautiful ocean and intracoastal waterway views from the terrace! We just returned from our stay in your apartment at the Alexander. Just wanted you to know we thoroughly enjoyed our stay at your condo. You have a lovely place. Little things like Klennex on both nightstands, a hand mirror in the bathroom, a beach umbrella, and a beach bag made the stay much more pleasant. The weather turned out perfect, too. Thanks for allowing us to rent..
P.S. I would only make one suggestion. You should purge all your old towels and replace them with newer softer ones. The cleaning service had all the old towels set up in the bathroom when we arrived. They are not soft at all. I later found newer towels in the linen closet. We had a wonderful stay on Miami Beach using your lovely condo. Maybe I can do it again next year. Just wanted to let you know that we loved your place! We had a wonderful stay. The staff there is very nice, it is a great location and it was plenty of room. I return to Miami regularly, so you may hear from me again. Brenda - Just wanted to thank you for the wonderful vacation rental. My family and I had a great time at your apartment. The resort was very nice and convenient to most everything. We utilized your chairs and beach toys, although we only went to the beach a few times as the seaweed was fairly heavy the week we were there. No matter, the pool was fabulous and we did a few day trips as well (Key Largo and the Everglades). Didn't realize there was a breakfast option in the hotel until near the end of the trip. Not very well publicized by resort. We typically ate breakfast in the room anyway but they can't be making much money on that one. I'm sure everything will be reported in order. The cleaning staff will barely have to work cleaning the room as we kept it pretty tidy. Will recommend your rental to anyone who asks. Hope to use it again ourselves one day. Thanks again and let me know about deposit return once confirmed. We stayed in this condo for a special anniversary trip that I planned for my husband and I - it is beautiful and we loved it. 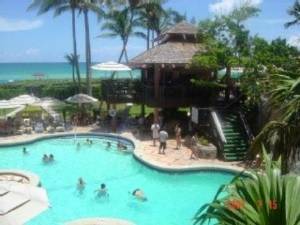 Excellent location - beautiful pool area, friendly staff. Would recommend it highly and hope to be able to stay there again. Deposit: $500 refundable damage deposit due upon booking. Returned to tenant within 14 days of check out as long as nothing has been damaged and no excesive cleaning is required. Cancellations and Refunds: full refund if cancelled 21 days or more prior to check in. After that not refundable unless replacement tenant is booked at same or better rate.